I assume you're talking about this? 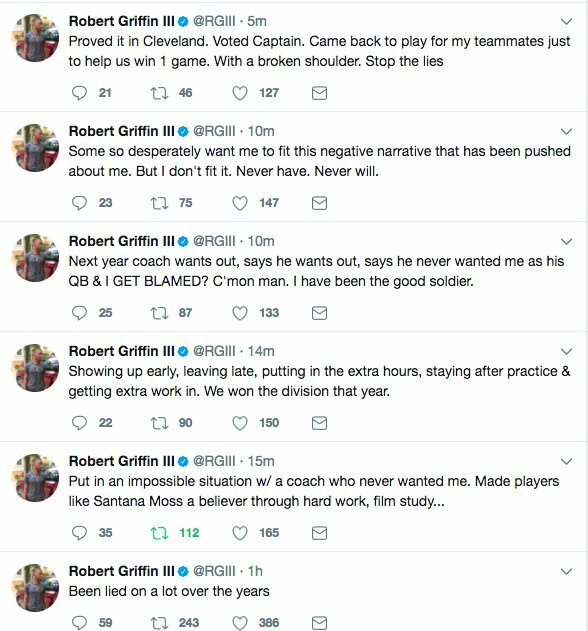 Robert Griffin III fired back at Santana Moss on Tuesday, one day after Moss claimed during an appearance on 106.7 The Fan that Griffin, his former teammate in Washington, gloated when Mike Shanahan was firedas the Redskins’ coach following the 2013 season. Griffin, who added that he’s been “lied on a lot over the years,” didn’t stop there. In a series of tweets that followed, the free agent quarterback described his first two years in Washington under Shanahan as an “impossible situation with a coach who never wanted me” and said he’s been “the good soldier” throughout his career. During his final two seasons in Washington, Shanahan repeatedly praised the Redskins’ trade with the Rams for the No. 2 pick that allowed the team to select Griffin out of Baylor in the 2012 NFL draft, but he has since made it clear that he had serious doubts about the decision. Shanahan did make it work during Griffin’s rookie year, and the Redskins won the NFC East on the strength of Griffin’s record-setting season. Everything changed after Griffin tore ligaments in his right knee in Washington’s playoff loss to the Seahawks in January 2013. There were reports that Griffin requested a meeting with Shanahan after the season and asked him to change his offense. In 2015, two years after he was fired, Shanahan confirmed that the meeting took place. He said Griffin wanted to throw more and run less, and mentioned specific plays that he would and wouldn’t run. No offense, but anyone that is still speaking about this dude has issues...including Santana. He's been gone...leave it alone...no one should be discussing him at all...people who do sound like bitter ex-girlfriends. Never seen a fan base be so focused on someone that no longer plays for them. He had the greatest single season in Redskins history. And will probably catch on somewhere this season. I think it's safe to say he'll be discussed for a long time. Pretty standard Redskins fanbase behavior really. agreed....who knows what really went on here. RG# has some mental issues it seems and Santana is a skins yes man. who cares about this? Im probably in the minority here, but I think he could start somewhere. His stats for the Browns last year weren't great, but he did manage to complete nearly 60% of his passes playing behind no line and with no talent around him. If the likes of McCown and Bortles can start, RG3 certainly can.